Trailer Mounted Guard Booth | Defenshield, Inc.
Guard house designed to be easily maneuvered for a variety of entry control point configurations. Can also be used for temporary gates without the need for brick and mortar structures. The Trailer-Mounted Guard Booth is thoroughly rugged and designed to withstand all needs and environments. The frame is made from a minimum of 2” x 2” x .083 structural mechanical steel tubing, with walls made from minimum 16-gauge galvanized steel panels inside and out. The floor is constructed of a minimum 12-gauge galvanized steel plate covered with aluminum diamond plate. Mounted on a 2” galvanized steel tube frame and joists, it’s designed to mount directly to the trailer. The unit comes completely weatherproofed to provide occupant comfort in all climates. Its roof features an all-steel construction with interior 16-gauge steel framing, and an 8” fascia offers removable lifting rings for easy hoisting by crane. Galvanized steel decking is covered with a 3-part membrane providing an SRI index of 95 or higher, and durability is ensured by the heavy-duty rust-inhibitive primer and fade-resistant high-impact polyurethane finish. The unit is electrically wired and features interior lighting, closeable weapons ports, an interior desk, mounted AC/heat pump unit and a full 360-degree view from inside. The Trailer- Mounted Guard Booth can also be outfitted with a number of additional accessories. 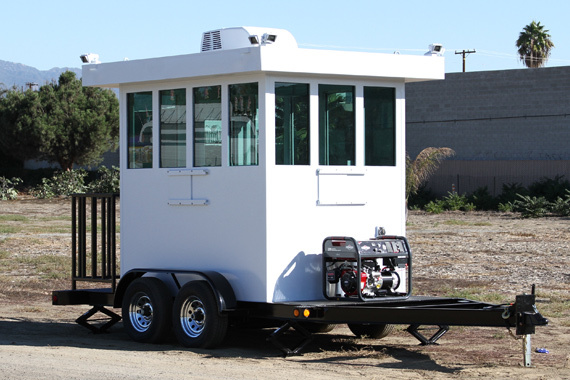 Available in ballistic and non-ballistic construction, the Trailer-Mounted Guard Booth comes with up to U.L. Level 9 bullet-resistant walls and windows.